Researchers from the University of Oxford have completed the first successful trial of robot-assisted retinal surgery. The trial, supported by the National Institute for Health Research Oxford Biomedical Research Centre, took place at Oxford's John Radcliffe Hospital. It involved 12 patients and is published this week in Nature Biomedical Engineering. Half were randomly allocated robot-assisted surgery and the other half to standard manual surgery to remove a membrane from the back of the eye. Using the robot, the surgeon was able to perform the procedure with equal or better efficacy than in the traditional manual approach. In the second phase of the trial, the team used the robot to insert a fine needle under the retina to dissolve blood in three patients who had age-related macular degeneration. All experienced an improvement in their vision as a result. 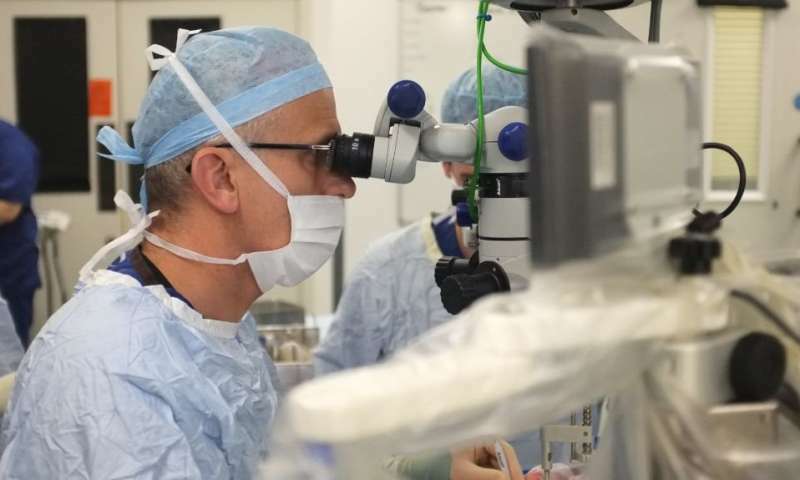 Robert MacLaren, Professor of Ophthalmology at the University of Oxford, said: "This is a huge leap forward for delicate and technically difficult surgery, which in time should significantly improve the quality and safety of this kind of operation. The trial also showed that the robot has great potential for extending the boundaries of what we can currently achieve. "Our next step will be to use the robotic surgical device for precise and minimally traumatic delivery of a gene therapy to the retina, which will be another first-in-man achievement and is set to commence in early 2019." Professor Marc D de Smet, Chief Medical Officer of Preceyes BV, the Dutch medical robotics firm that designed and developed the PRECEYES Surgical System, said: "The current trial demonstrated and confirmed the safety and precision of our design. Providing precision, accuracy and stability beyond human capabilities are pre-requisites to push the boundaries of existing surgeries and standardising current procedures." The surgery involved the dissection of the epiretinal membrane and inner limiting membrane over the macula, the central region of the retina responsible for fine visual acuity, in six of the patients, as well as the injection of a therapeutic drug (recombinant tissue plasminogen activator) under the retina to displace sight-threatening haemorrhage in three patients. In 2016, Oxford University signed an agreement with Preceyes to test the robotic surgical system, and a team led by eye surgeon and researcher Professor Robert MacLaren began the human clinical trials using the PRECEYES Surgical System.